I remember the first moment that I was truly happy to be a solo traveler. 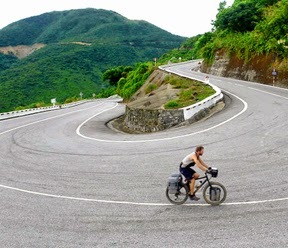 It was in Chiang Mai in the third month of my trip (I’ve now been traveling solo for 15 months) and a friend and I had spent all day motor biking around the surrounding mountains. They were beautiful, but come nightfall we were darn hungry. We met up with a group of his friends who insisted on eating dinner together, “as a family,” they kept saying. However, they weren’t hungry because they had just had ice cream, so everyone was expected to wait until the group was all together and felt like eating. I gave my friend a hug, said I’d had a wonderful time with him, but I was starving and felt like doing my own thing. He completely understood. On my walk home, eating mango sticky rice from a street stall following a meal of satay and papaya salad, I suddenly felt exceedingly happy with my decision to travel alone. Traveling solo didn’t mean I would be lonely, it meant I would have complete freedom. I’ve said before that I was really terrified to travel by myself. Not only that, I was worried about my ability to be outgoing. I thought I’d be very lonely. I used to be very socially awkward. I was a painfully shy child. I would often timidly sit silently when someone was trying to talk to me. I was easily overwhelmed by talking with people I didn’t know. In time, I grew out of it, but I still had the uncanny ability to turn quiet in social situations. If out at a bar, if there was a TV on, I’d tend to just zone out on it. If I met someone with a strong personality, I’d sometimes get sheepish and become a mute. She would then think I was stuck-up or disinterested in her friendship. “You can be SO awkward sometimes!” an ex boyfriend used to say to me. Anyone who has met me traveling would probably be pretty surprised to read that. It’s funny how much things have changed since I started traveling alone. Travelers are by nature open people. I couldn’t really imagine sitting at a restaurant in Orange County, where I used to live, and starting a random conversation with the stranger next to me, or getting invited to join a group. But on the road in Southeast Asia, sometimes people would see that I was alone, so they’d invite me to join them. I started doing the same when I saw solo travelers. Not only that, I ran into the same people all the time. It was great seeing someone from Cambodia in Laos. Often we’d just decide to travel together for a while. Suddenly, I wasn’t solo anymore. We had a lot in common just by virtue of being solo travelers. I felt it again when I returned to Pai, looking around my group and realizing that there were 8 of us, all of whom were actually solo travelers. Knowing that so many people (women too!) do travel alone is something I wasn’t aware of before I started my trip, and it would have been really reassuring to know back then. So let me tell you, travelers are friendly, traveling alone opens you up to meeting people. On the other hand, it also helps you to deal with being a loner at times. I used to really hate to be alone, and I would sometimes get depressed when I was by myself for too long. It was one of the things I wanted to work on as a solo traveler and had failed to do for the first year of my trip. I was so concerned with always surrounding myself with people that I took very little time to myself. That has actually changed too. I’m starting to enjoy ‘me’ time and have begun to realize that my reasons for needing to be surrounded by people probably came from my need for approval. Traveling has made me more comfortable with ME. This has made me a less shy person. I have no issue in most social situations now, and have really learned how to become self-reliant. So if you’re shy, please travel by yourself. Please don’t be afraid that you’ll be alone. Give yourself the chance to be wowed by your own adaptability. Tell me about your experience. How has traveling solo changed you? Do you want to travel solo but are afraid? Tell me about that too!